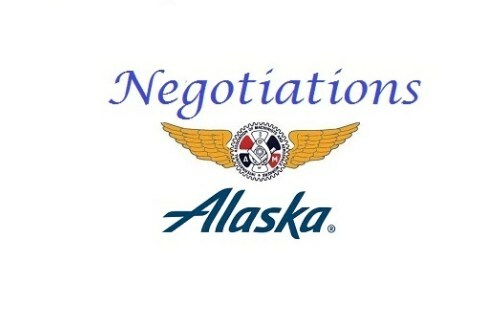 The joint Alaska Airlines Negotiating Committee continued negotiations with Alaska Airlines management February 5-6, 2019 in Seattle, Washington. Represented by the Company were: Shane Tackett, Executive Vice President/Strategic Planning; Wayne Newton, Vice President/AOCS; Jason Berry, Managing Director/Cargo; Bob Hartnett, Director/Labor; Jeanne Davis, Director/Call Centers; Denise Kliskey, Manager/Labor; Rebecca Meissner, Senior Attorney; and Melinda Maher, Division Controller. Joining your Negotiating Committee were: Kris Hannah, Grand Lodge Representative; and Brianna Gregory, Grand Lodge Representative. The session was vastly spent negotiating over the Scope (Job and Work protection) of both COPS and RSSA Agreements. The sides have a fundamental disagreement over the issue – the Company wants to protect jobs, while making no provision over protecting work — the very work that each and every one of you perform, in award winning fashion, each and every day. Your Negotiating Committee, however, understands that without work, there is no job to protect. At the end of the session, the Company’s desire is to retain the right to contract out our work. We remain steadfast in protecting the work in the locations that we do that work. We will continue to convey this message to the Company. Due to the forecasted snow event in Seattle this upcoming weekend, and possibly into next week, the parties have agreed to cancel the session previously scheduled for February 12-14, 2019. The next session will be held March 12-14, 2019, location TBD.